Folio 34 from 'Picturesque Scenery in the Kingdom of Mysore' by James Hunter(d.1792). This aquatint is based on a picture by Hunter. 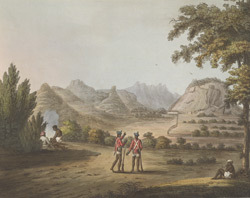 It shows one of the hill forts encountered by British troops, probably during the Third Mysore War (1792). During the latter half of the 18th Century, large areas of southern India were controlled by Haider Ali Khan (c.1722 - 1782) and his son, Tipu Sultan (1753 -1799), who ruled from their capital at Seringapatam. The 4 Anglo-Mysore wars produced a spate of publications and paintings portraying and describing events of the various campaigns. Hunter served as a Lieutenant in the Royal Artillery and his sketches portrayed aspects of military and everyday life.